I thought this was going to be a fun contemporary. Why? I'm not sure. Maybe it was the cover. Isn't it a great cover? It is a fast read. I zipped right through it. But, it's heavy. It was heartbreaking. Being a mom, my heart broke for those kids. I kept wanting to go over there and take care of them. Give them their childhoods back. Give them something. 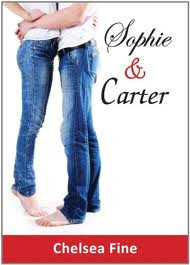 I'm glad Sophie has Carter and Carter has Sophie. I was worried they'd never get together! Loved it! The prose is actually quite beautiful. It is written really well. I want more. I want more of the characters and the story. I went to bed thinking up what really happened to them later. Beautiful story of triumph over trials and finding true love. Great read! I wish author Chelsea Fine would write a sequel! "He's not the most popular guy in school. He's not the hottest guy to ever live. But to me, he's everything." There is going to be a sequel!!! Hopefully out by next year is what Chelsea Fine said! So excited!